It can be challenging to stay focused and find joy when all you see is negativity wherever you effin' turn. I'm not the one to tell you to put on a smile and fake that ish. No, that ain't me on a Monday morning, B. What I will say to you is to recognize what you are feeling and choose to go on with your day. Embrace this opportunity for a much-needed positivity boost from yours truly, through a little self-talk exercise. To get started make sure to acknowledge that you must take ownership of your emotions. Refuse to let anyone else control your happiness. Prepare yourself for some Self-talk. Self-talk gives you an opportunity to rebuild confidence and trust within yourself without having to ask anyone else for permission to do so. 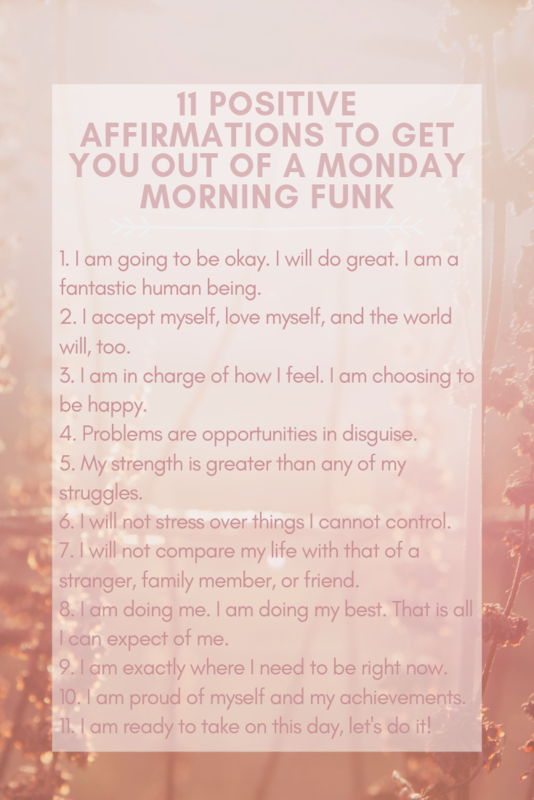 Once you have that at the forefront of your mind, read out loud or very loudly in your mind these 10 positive affirmations to help chase away those Monday blues so you can that you can get your day started and get your mind right. 1. I am going to be okay. I will do great. I am a fantastic human being. 2. I accept and love myself, and the world will, too. 3. I am in charge of how I feel. I am choosing to be happy. 4. Problems are opportunities in disguise. 5. My strength is greater than any of my struggles. 6. I will not stress over things I cannot control. 7. I will not compare my life with that of a stranger, family member, or friend. 8. I am doing me. I am doing my best. That is all I can expect of me. 9. I am exactly where I need to be right now. 10. I am proud of myself and my achievements. 11. I am ready to take on this day, let's do it!